In offices and universities where dozens or hundreds of computers are used, administrators must ensure that noise is kept to a minimum to avoid annoying other workers. One method is to remove all speakers from the working environment but this is often impractical since many PC users rely on sound to get work done. Administrators do, however, eliminate all unnecessary sounds that emanate from Windows 7. 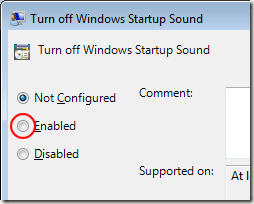 Learn how to turn off the Windows startup sound for all users of Windows 7. 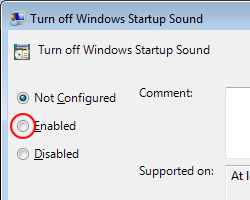 Why Turn off the Startup Sound for all Users? Although Windows 7 is capable of many multimedia features, constant sound from many computers creates a noisy and distracting environment for workers in an office or students in a university. This is especially true in service centers and computers labs where all PC users are in one large room. Reducing white noise in these environments is the administrator’s job. Every time a PC running Windows 7 is turned on or restarted, the operating system plays the startup sound by default. Rather than turning off the startup sound on a PC-by-PC or user-by-user basis, administrators can use a group policy to turn it off for all users of Windows 7. This also prevents users from turning it back on by themselves. To make the policy change described here, you must first log in to Windows 7 using an account that has administrative privileges. Once you do, click on Start>Run to open the Run dialogue box. If you don’t have the Run command on your Start menu, hold down the Windows key on your keyboard and press the R key. Type gpedit.msc into the Run dialogue box and click the OK button. You are now looking at the Local Group Policy Editor. In the left hand pane, locate the policies located at Computer Configuration>Administrative Templates>System>Logon. Be sure to click on the Logon folder. 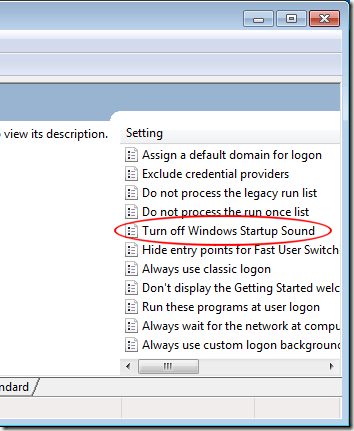 In the right hand pane, locate and double click on the policy titled Turn Off Windows Startup Sound. 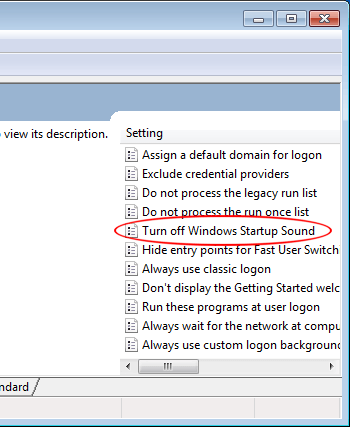 You should now be looking at the Turn Off Windows Startup Sound policy window. If no one else has changed this policy’s settings, the Not Configured option should be selected. Click on the Enabled option, click the OK button, and you are done. Now all users of Windows 7 will have the startup sound disabled. In large computer rooms such as service centers and university computer labs, too much white noise is a distraction for people trying to get work done. One thing administrators can do is reduce the unnecessary sounds made by Windows 7. One of the first sounds that can go is the startup sound. This is especially true in mornings when PCs are turned on for the first time that day. Of course, there are other sounds that administrators should turn off to create as silent an environment as possible for workers and students. The startup sound, however, is a good place to start.